DAMASCUS, Syria (AP) — Syria’s chief-of-staff on Thursday declared a wide-ranging ground offensive by government forces, a day after Russian airstrikes and cruise missiles launched from the Caspian Sea backed Damascus’ multipronged advance into two Syrian provinces. In a rare televised speech, Gen. Ali Ayoub said the Russian strikes have facilitated an expanded military operation to eliminate “terrorists” — a term the Syrian government uses to refer to all armed opposition to President Bashar Assad. The Syrian ground push got a boost after Russian warships launched the cruise missiles into Syria on Wednesday, bringing a major new military might into the war on the heels of Russian airstrikes that began last week. The cruise missiles hit the provinces of Raqqa and Aleppo in the north and also Idlib province in the northwest, Russian officials said. The Islamic State group has strongholds in Raqqa and Aleppo, while Syria’s al-Qaida branch, the Nusra Front, has a strong presence in Idlib. 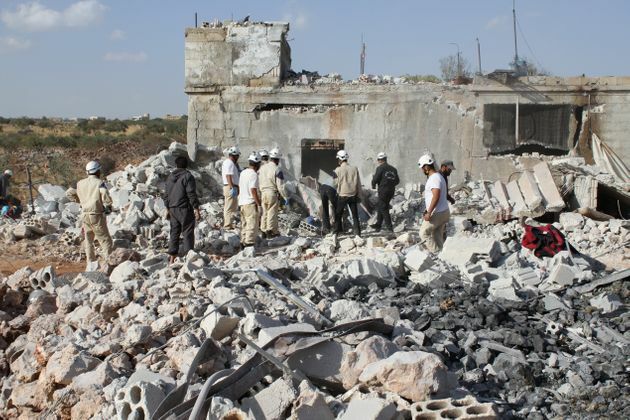 Moscow insists it is only striking militants but the Britain-based Syrian Observatory for Human Rights said Russian airstrikes in Idlib killed at least seven civilians on Wednesday. Previously, at least 40 civilians were killed on the first day of the Russian airstrikes last week. “After the Russian airstrikes, which reduced the fighting ability of Daesh and other terrorist groups, the Arab Syrian armed forces kept the military initiative and formed armed ground troops, the most important of which is the fourth legion-raid,” Ayoub said, using the Arabic acronym for the Islamic State group. Syrian activists said government troops pushed from areas they control in the rural part of Latakia, into rebel-held areas in the province that is the heartland of Assad’s family and Alawite minority group. Latakia is the third province to see ground operations since Wednesday. The head of the Britain-based Syrian Observatory for Human Rights, Rami Abdurrahman, said the troops moved from the village of Jorin into other parts of rural Latakia and Sahl al-Ghab, a vital plain that lies between Latakia, Hama and Idlib provinces. Jaish al-Fatah, or the Army of Conquest, a coalition of rebel and militant groups that includes the Nusra Front, operates in the area. Foreign fighters, particularly from Asia and China’s ethnic Turkic Uighur minority, have also a strong presence in the area, according to Abdurrahman. The Observatory chief said Thursday’s push was along the lines of rural Alawite villages there. The minority Alawites — an offshoot of Shiite Islam to which the Assad family belongs — make up most of the residents of the coastal Latakia and Tartous provinces. Lebanon’s Al-Manar TV, which belongs to the Shiite militant group Hezbollah and which fights alongside Assad’s troops in several areas in Syria, said the Syrian army seized control of al-Bahsa village in Hama on Thursday. Wednesday’s ground offensive by the government focused on a number of towns and villages in rural Hama and northwestern Idlib province, sparking intense clashes. Activist Ahmad al-Ahmad said rebels repelled government troops from at least one village. Syria’s conflict, which began as an uprising against Assad in March 2011 but descended into a full-blown civil war, has so far killed 250,000 people, according to the United Nations.